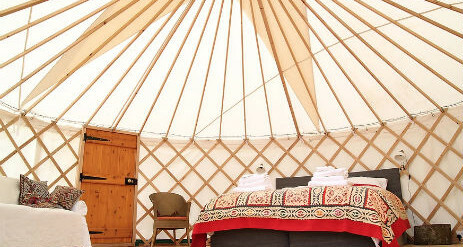 Treat yourself to a luxury glamping experience at Walnut Farm in West Dorset in one of our two beautiful handcrafted yurts. ​Walnut Farm is a family home with 12 acres of land nestled between stunningly beautiful rolling hills in the tranquil hamlet of Hinknkowle, on the edge of a nature reserve. Despite being tucked away in beautiful countryside, we are less than 5 minutes’ drive to the vibrant market town of Bridport and pretty harbour of West Bay on the Jurassic Coast, a World Heritage Site. You’ll never be short of things to do around West Dorset. Walk the South West Footpath along the cliffs, explore the many beaches, discover the sea by speed or fishing boat or head inland and discover our local towns and village. Of course, if you would rather not leave the farm, stroll around our apple and cherry orchards and across our fields. There are two footpaths that lead directly from the farm leading to unspoilt countryside and nature reserves, the other heads towards the Half Moon pub in Melplash, with its traditional thatch, inglenook fireplace and wonderful sunny beer garden, serving fabulous locally sourced food and it is just a 10 minutes walk. 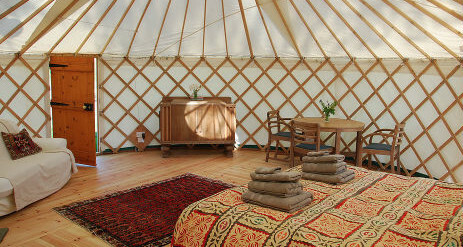 Each en suite yurt is set in its own secluded paddock and is surrounded by apple and cherry orchards with spectacular views of the countryside. We have crafted a little haven for you to enjoy a truly luxurious and peaceful break. 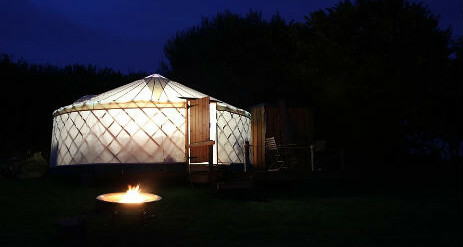 Russet sits in its own private paddock above the farm, enclosed by a long sweeping living willow fence. You have your own private sawn larch deck to the front of the yurt with a table and chairs to sit and enjoy long lazy meals or a good book – the views of the sunset over the hill are not to be missed! 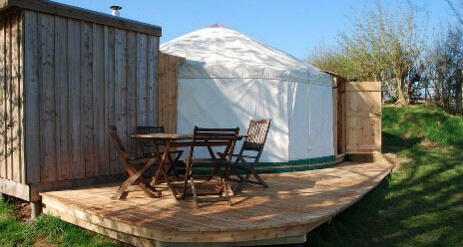 Pippin sits in its own private paddock above the cherry orchard and has spectacular views across the valley towards the Jurassic Coast. 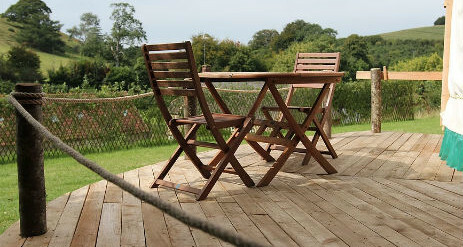 With two outside seating areas you can enjoy the sunrise from your sawn larch deck and watch sunsets from your rustic wood chip outside dining area! 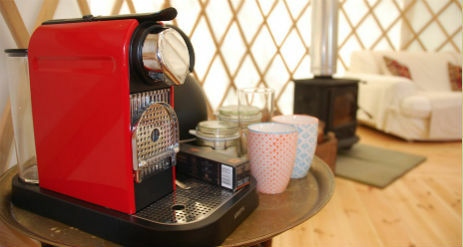 INSIDE Russet and Pippin you will find…. If you would rather a campfire and barbecue, there is a beautiful copper fire bowl by Pippin that is perfect for both!